More details of plans to build a skyscraper at Chiswick Roundabout are likely to emerge at a public exhibition to be held later this month. 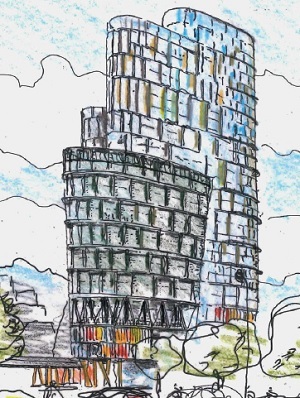 As yet no indication has been given as to the height of the building but it has been previously suggested that the tower could be up to 42 storeys high which would make it the tallest building in West London. A company called Starbones Ltd is looking to redevelop the vacant site, bordered by the Great West Road and Gunnersbury Avenue (formerly known as the Octopus site). The site lies at the eastern end of the A4 'Golden Mile'. Kim Gottlieb, the director behind the original plans for the Octopus is on the board of Starbones along with Stephen Conway, the chief executive of Galliard, the developer who was reported to have acquired the half acre site earlier this year, along with American private investment company Cain Hoy and ARV Investments from Kim Gottlieb's London and Bath Estates. The plans will include both office space and residential units. The developers will be holding public exhibitions of the evolving plans at The London Museum of Water & Steam, Kew Bridge Road, Brentford, TW8 0EF. There are some more limited details on the scheme's web site but as yet no actual plans have been put on the site. You can also give feedback directly. The developers claim that an outward facing design approach and public realm strategy will overcome the severance effect of the M4 flyover. They are also promising an improved pedestrian and cyclist environment beneath the M4 flyover.